Video, 00:39 minutes, colour, English / Turkish. Giving water and land voice, this video imagines activities along the Euphrates River over the span of a day. The storyline subtly references the murder of Ahmed Jabbar Kareem Ali, a 15-year-old boy drowned by British troops in 2003 after accused of looting in one of the tributaries of the Euphrates in Southern Iraq called Shatt al-Basra. His fictional ghost anchors the narrative by raising questions about power manifested by those who control access to the river and land, its resources and history. 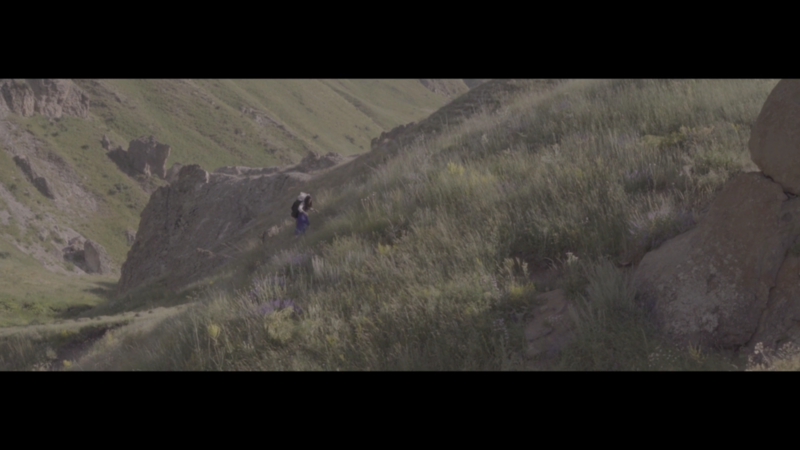 Act 1: The video begins with a panoramic view of reservoirs created by Turkey’s expansive Eastern Anatolian dam projects. Looking south towards the Syrian border from Mount Nimrud, the landscape is cloudy with dust and haze. The scenery cuts to Atatürk Dam, the biggest dam in the region, with narration from the engineer character who has worked with various contactors in this region. He discusses issues related to land submergence caused by expanding reservoirs and mentions rumours about a young boy who allegedly swims into the dam’s outlet gates and tampers with the hydroelectric turbines. Act 2: A local archeologist investigates an illegal excavation carried-out by potential treasure hunters. In examining the site of a tell (a mound formed from accumulated waste of generations of people living on the same site for hundreds or thousands of years) she points out how crudely it was dug and establishes that items were removed. In speaking of the unusual location of the site by Lake Tuz, a salt lake that often appears as a mirage, she claims to have seen a figure coming towards her but as she zoomed in with her camera to get a better look, it was strangely gone. Act 3: Six boys play in the basin created by the intersection of two rivers around the source of the Aras River. This mountainous region in Eastern Turkey is also the source of the Euphrates River. Historically both rivers hold great spiritual and political power. In mid-3rd millennium BCE (Early to Middle Bronze Age), the Euphrates is referenced as a divinity. Splashing and shouting, the boys swim, fish with a net and pick mint along the riverside. Act 4: A young girl from a village on the edge of a tree plantation at River Murat walks slowly beside its loud, rapidly flowing water. The river is one of the two-headwater sources feeding the Euphrates, and is often referred to as the separation territory between ‘peaceful villages’ and the so-called ‘terrorist’ occupied valleys. Strangely, the girl has two silent megaphones sticking out from the top of her large knapsack. In her journey down the river, she decides to cross the separating tree line and climb a hill. Her friend runs up the hill and tells her to turn back. Suddenly, they encounter a grave recently dug up by treasure hunters looting Armenian graves in the area. Act 5: This act takes place in a village situated in the valleys of Karasu (Black Water) River, which is the other headwater source feeding the Euphrates River. The village sits below a NATO training and surveillance station shown in the background. The central character is a local imam from Erzurum who is giving a speech in the small local mosque about the connections between water and power in Islam. He cites the story of Moses and Khidr from the Quran, in which Khidr murders a young boy without explanation. During his speech, the imam notices Pejvak, the artists of this video, filming his speech without permission and the scene comes to an abrupt end. Once, in a time of turmoil, we swallowed a boy and held his breath between ours. We succored him with our tears as we carried him to our home. There, in the mountains, we planted him...and from his breath, sprouted a tree.